Fall Session 1 at Art Farm Co op, LEA 28 is ending on Sunday, November 8th. Everyone is welcome to visit the new gallery spaces and installations that will remain up through then. 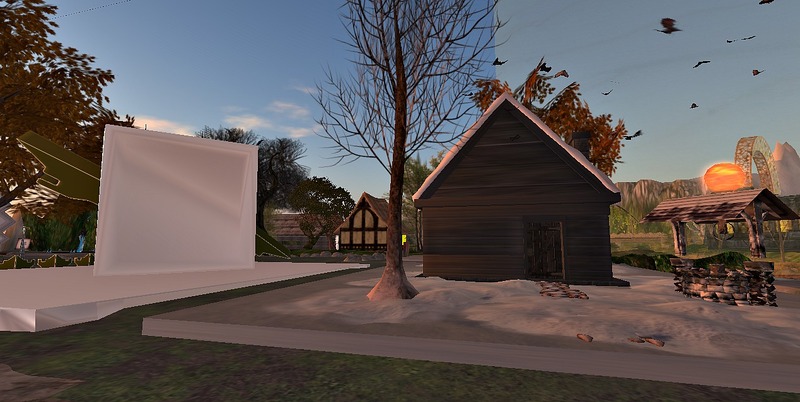 The other three quadrants, Youth Hostel (camping) Cafe Society (machinima and performance) and Jolly Pirate Books ‘N Grog will be closing as well. There are details at the bottom of this post if you would like to participate in the opportunities at LEA 28 this round. 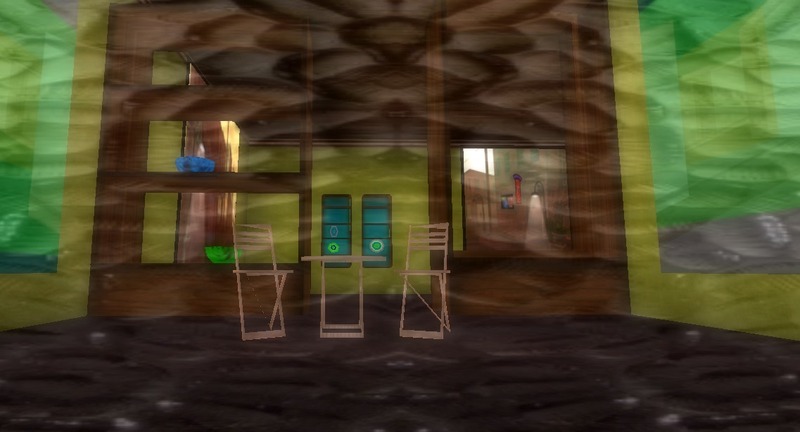 The photo above was taken through the front window of antsue’s space. This artist also has a couple of free 3D pieces in the “large exhibit” area, which are actually reasonably sized. A new artist to this project is Alegra, with photographs in the theme of Sweet Melancholy. Veyot has returned to put some colorful things in this space. There’s a free 3 prim art sandwich with instructions that I’m looking forward to learning how to use. I snapped this standing in the middle of the space Dulcis Taurog filled with both 2D and 3D art. 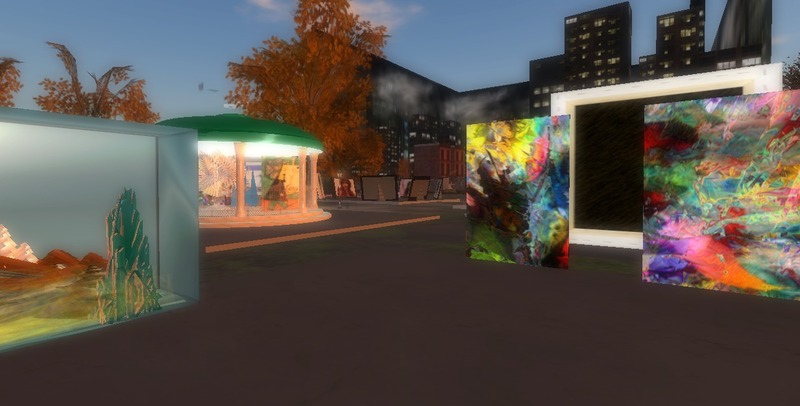 The pavilion in the background has several types of art media by AlexandreLois1 with new recent additions that are well worth checking out. 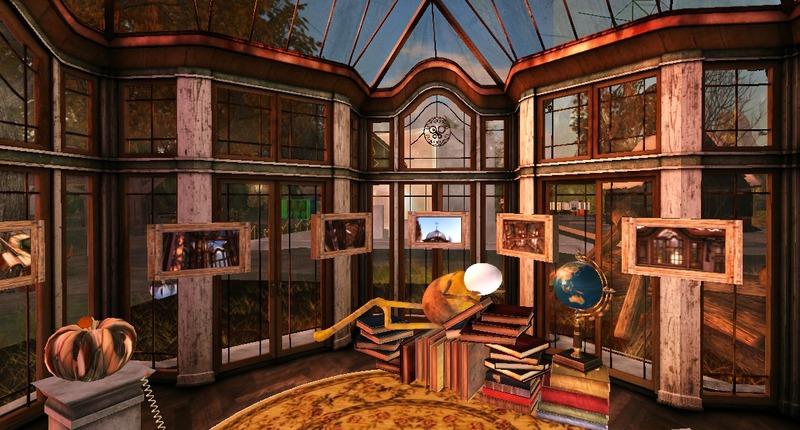 I put up another structure, the Kowloon Memory by L2 Studio. Both upstairs and downstairs display photographs with vintage look effects, the photos I also have shown on this blog about the flood in New Toulouse as well as in the post about the destination and rp sim IIe Sainte Marie-les-Bains. There’s a glitch slideshow I put together and also a drawing done by Elle Thorkveld. Next to my gallery, in the right of the photo is Van Caerndow’s space displaying some of his work and where he holds his Drinking and Drawing classes on Monday evenings. 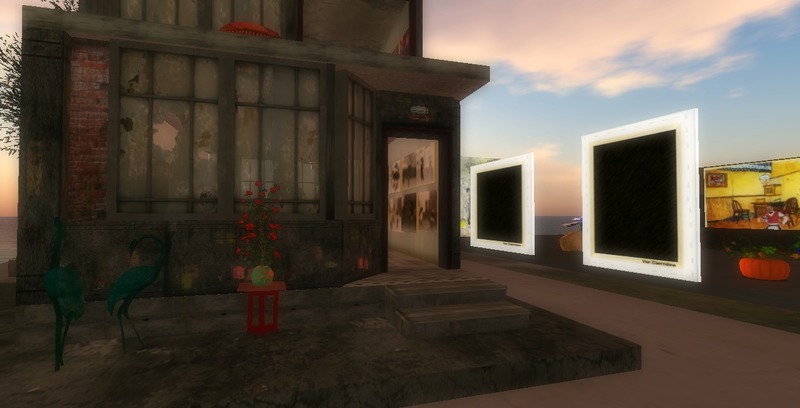 Elle has displayed some generative art and photos as well as making some new 3D sculptures in her gallery as well as the large exhibit area. There are tutorials available in prims here. She has done a wonderful job facilitating the Self Serve Pop Up Galleries. Tiffany Mosienko has displayed a project with old postage stamps, documents and other pieces of Illinois history. They’re interesting and well organized. Serra Quendra has an inviting gallery with quirky autumn decorations in the yard. The wooden framed art photos are free gifts. She’s also contributed a lot to the Youth Hostel area next door. 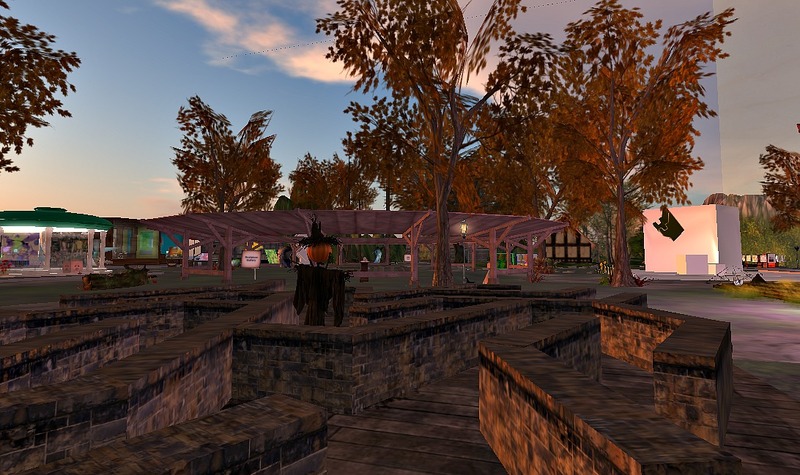 The autumn maze by Kimika Ying completes my photos for this post. Kimika has contributed greatly to the success of Self-Serve Pop Up Galleries. The open structure in the center background holds the sculpture garden. There will be a two week break at Art Farm Co op, then Fall Session 2 will be six weeks, from November 21 — December 31. 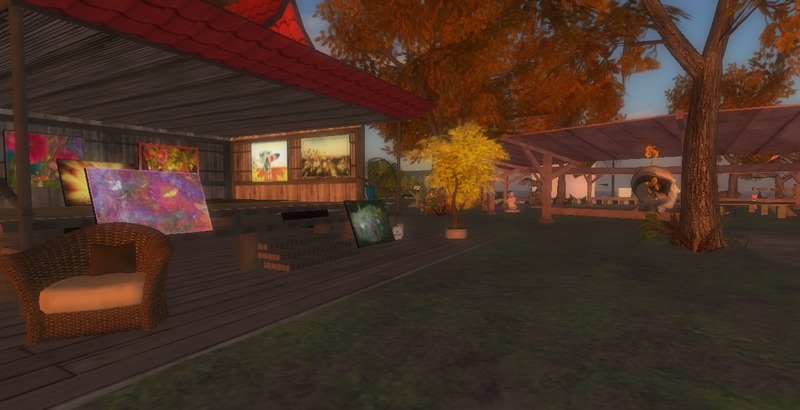 We are having a sort of meeting/party/display of creativity and works in progress on Sunday the 8th of November at 9:00 a.m SLT. Visitors are welcome to attend and meet some of the active participants, learning more about what might be happening during Fall Session 2. At the ending celebration of the summer session, proposals were called for and four were chosen for Fall Session 1. It’s more open ended this time; communication and information haven’t been forthcoming. We’ll come up with some sort of play, creativity and community though. This is a wonderful opportunity to become more comfortable with the LEA grant process and to meet supportive avatars. I’ve blogged about Art Farm Co op here and also wrote about the Summer Session and gave links to resources in this post. Great review of the Art Farm Co op! 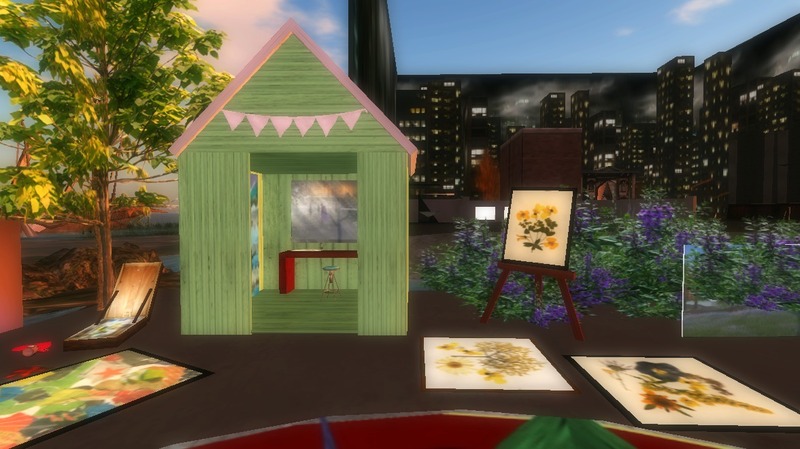 what fun!- “pop up galleries”. I saw yours Pearl- lovely soft dreamy images- I love the vintage look! !